The Embraer EMB-145 EP is a twin-engine short-haul feeder-liner jet for up to 50 passengers. Embraer, the Empresa Brasileira de Aeronáutica S.A., is a Brazilian corporation, founded in 1969. Embraer was a nearly bankrupt concern when it was restructured and privatised in 1995. Today it is one of the largest aviation manufacturers in the world, producing regional commercial, military, and corporate aircraft. Embraer began working on a 50 seat short-haul feeder-liner jet concept in the late 1980s. The original Embraer EMB145 concept was launched in mid 1989 and originally used the straight-wings of the EMB-120 as well as a stretched version of the EMB-120 Brasilia fuselage. Later redesigns evolved to include swept wings with supercritical airfoils allowing improved performance. The engine location also moved from above the wings to below the wings and finally to the tail before the design was finally frozen. The Embraer EMB145 was flown first on 11 August 1995. It has a range of about 2500 km. The EMB-145 was renamed the ERJ-145 EMBRAER Regional Jet since. Three basic versions of the ERJ145 are available: Extended Range (ER), Long Range (LR) and Extra Long Range (XR) versions. Since first delivery in December of 1996 to Continental Express in the USA, more than 700 of these successful Embraer jet aircraft have been delivered to operators around the world. 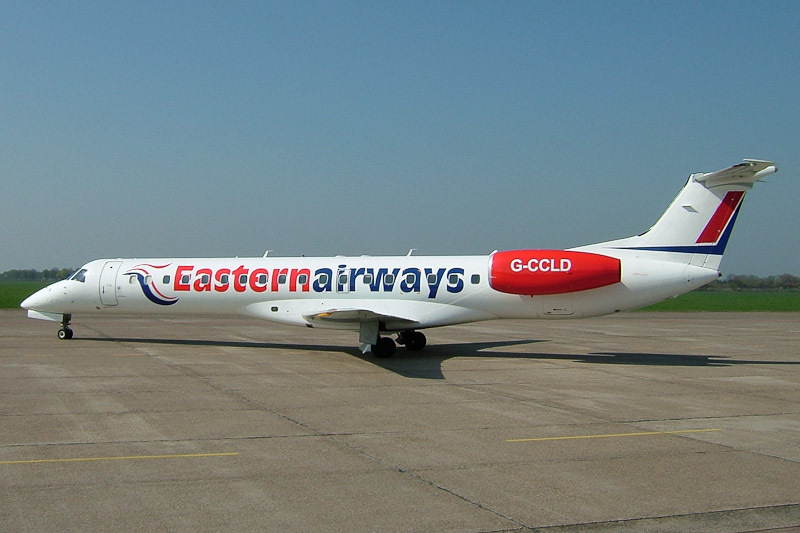 On 12 February 2004, Embraer EMB-145EP s/n 145-169 was registered G-CCLD in the UK with Air Kilroe Ltd., trading as Eastern Airways. This 1999 built Regional Jet was operated before as SE-DZC by Skyways in Sweden. Eastern Airways EMB-145EP G-CCLD was photographed on 16 February 2004, the day Eastern Airways began a daily regular service Aberdeen-Norwich-Groningen vv. flown with their EMB145EP Regional Jet. On 4 May 2004, with the start of the new bmi regional service Aberdeen-Groningen; Eastern stopped their Aberdeen-Norwich-Groningen service.